Rod Abrams Funeral Home Ltd. Barbara Eldridge - Rod Abrams Funeral Home Ltd. Followed by a reception at Taste of Freedom (24 Mill St. W. Tottenham). Peacefully at Matthews House Hospice Alliston, on Saturday February 2, 2019. 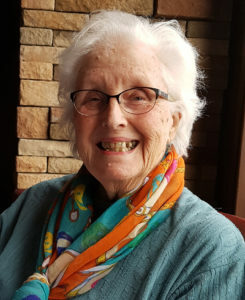 Barbara Eldridge (nee: Sexton) at the age of 85 years, beloved wife of the late Glendon Vernon Eldridge. Loving mother of Dane Eldridge (Sandi), and Kim Eldridge. Dearly loved grandmother of Derek, and Stephanie (Jamie Langford). Sadly missed by her great grandchildren: Deacon, Dalton, Isobel, Lily, and Logan. Forever in the hearts of her extended family and friends. I am in complete shock at the passing of Barbara. I am deeply saddened. Barbara was always happy to participate in any and all outings we had, I could always count on her to join in on the fun. She was one of the happiest people I knew, always smiling and laughing. I always looked for her and we chatted often. I will miss you dearly my sweet friend. Dane so sorry for the loss of your mom. It is never easy to say goodbye no matter what age she is. Our thoughts and prayers are with you. Dane and family: Thinking of you all during this difficult time. Please accept our sincere condolences on the loss of your lovely mother, grandmother, and great-grandmother. Barb was a very special lady who was always a pleasure to be around. All the family is in our thoughts and we share in your sorrow. Fly on angels’ wings lovely lady! Dane,So sorry for the loss of your Mom. Our thoughts are with during this sad and difficult time. So sorry for your loss. We are away south and will not be able to attend but will keep you in our thoughts. We were so sad to hear of your Mom’s passing.i loved your Mom, she was so special. She was my matron of honour when we married. Shirley sends her condolences as well. So sorry to hear about Aunt Barb. She and Uncle Glen were always so kind, helpful and keeping in touch with my parents Ernie Eldridge and Barb Eldridge before they passed away. Our condolences to you and your families. Dane and Kim, so sorry for your loss. I just found out. I will treasure all the times I came up during the Summer and spent with your mom, dad and Kim. We had lots of laughs. You both are in my thoughts and prayers. Dear Kim and Dane and family – sorry to hear of your Mom’s passing. You are in our thoughts and prayers. We are so sorry to hear that Barb passed away. She and Glenn always welcomed all of us into their home, and treated us all very well. We will always remember them with love.